Learning to cook is an important thing for kids to do. Cooking is a vital skill to learn, to set kids in good habits for when they get older and eventually move out. Kids may also be more willing to try new foods if they have helped in the preparation. So, choosing a good cookbook is vital in helping encourage a keen interest in cooking from an early age. The books we have reviewed here are all aimed at children, and give step by step instructions and colorful images to keep them interested and engaged. There are 15 great recipe books in our review below, and you’ll also find some buying tips and guides. 2.0.1 What are the Benefits of Learning to Cook? 2.0.2 How Can I Encourage my Child to Eat Healthily? Cookbooks for children should be clearly written and age-appropriate, to make sure they can understand the instructions being given. It also helps if they provide photos of the finished recipes so your child can have an idea of what the dish should look like. Some kids recipe books have a glossary of key cooking terms which can help if your child has little or no previous experience. You should also think about the types of food your child enjoys. Some kids prefer baking to cooking, perhaps because they enjoy eating the yummy treats they have baked! If you know what your child likes to eat and to make, this can help guide your decision. However, many of the books reviewed here include recipes for main meals as well as cakes and bakes, so there is plenty of variety for your child to try. 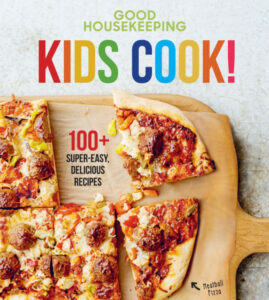 Below, you’ll find our picks of 15 highly-rated cookbooks for children, with a brief description of each and why your kids will love it. The Complete Cookbook for Young Chefs includes over 100 recipes from America’s Test Kitchen which have been thoroughly tested by kids to ensure they meet the mark! There are recipes for all times of day, including breakfast, dinner, snacks and the all-important desserts. Not only will you find recipes, there are also photos showing step-by-step techniques to help boost your child’s confidence in the kitchen. The book is broken down into convenient sections, including one on healthy eating. There is also a glossary containing every cooking term a child needs to know. These include different styles of chopping, cooking and mixing, as well as information on different types of ingredients commonly used. Each recipe in the book has a photo of the finished dish, as well as information on how many portions the recipe makes and the preparation time required. This is great for helping kids learn to plan ahead! This kids recipe book is aimed at children aged from 6 – 12 years old and contains over 50 recipes they are sure to love. It demonstrates essential cooking techniques for youngsters to learn, in age-appropriate language to ensure they can follow along. The recipes included are simple yet yummy and include dishes such as applesauce, pizza and popcorn chicken. The book makes eating fun for kids too, by showing them how to present food in a fun and imaginative way. Friends and family are sure to be impressed when they see a plate full of fruity flowers! There are useful extras included with the book too, such as labels for jars of homemade goodies, food-themed games and place cards to show everyone where to sit for their special meal. 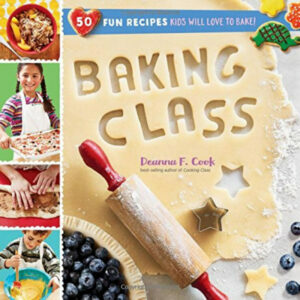 This book is the follow-up to the Cooking Class book reviewed above. This edition focuses on baking and associated techniques such as kneading bread and decorating sweet treats. It’s aimed at those aged from 8 – 12 years old and includes 50 straightforward recipes. Kids can also learn how to measure out ingredients – an important skill when baking! Some of the recipes in this book include fruity muffins and savory breads. Like the Cooking Class book, Baking Class comes with bonus items such as gift tags, which are perfect for gifting homemade goodies to a friend. There are also signs for having a bake sale, which is sure to be a confidence-booster for your child. You will also find cupcake topper flags and cookie templates to create a range of fun shapes. This is a great, healthy kids cookbook from a known and trusted publisher, namely Good Housekeeping. There are over 100 recipes included, each with color photographs to accompany the instructions. Some of the dishes include kid-friendly favorites such as lasagna, burgers and smoothies. The whole family will love eating the tasty dishes found in this book, and kids will love taking the responsibility of cooking dinner for the family. There are even recipes for delicious breakfast, perfect for kids to cook with friends after a sleepover. This is a great book for encouraging kids to try new and healthy foods. This book from American Girl is filled with over 40 great baking recipes including classics such as cookies and cupcakes to something a little more different like fudge and blondies. Every recipe is delicious and written in an easy-to-follow way. Kids are encouraged to add their own unique twist on these recipes, as they don’t have to be strictly followed step-by-step every time. This kids baking cookbook will appeal to girls of any age, even those who have outgrown the American Girl dolls. There is nothing to stop a young teen using and enjoying this book, too. There are recipes for every occasion, from quick and simple cookies to fancy raspberry tartlets when your child really wants to impress! This Williams-Sonoma book contains over 60 recipes for a variety of dishes, ranging from tacos to crepes and everything in between. There are also some great after-school snack ideas which are great for encouraging kids to snack healthily. Not only does each recipe include a color photograph of the prepared dish, many of the pages also contain fun facts to help educate and interest your child further. Kids aged around 7 years old and above will love this book, which appeals equally to boys and girls. There are some healthy options included, as well as some more indulgent treats. Many of the recipes are at a slightly more advanced, although not difficult, level which gives kids a greater sense of accomplishment when they have finished making the dish. 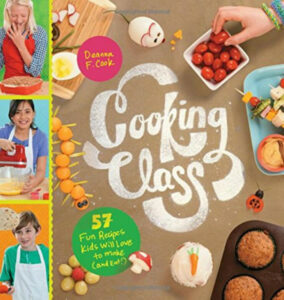 This is a fun cookbook which is aimed at children aged from 6 – 10. It is spiral bound which means it sits flat on the work surface for easier use. Each chapter of the book is dedicated to a different meal, including breakfast and brunch, supper and desserts. The recipes in this book are well laid out, with each containing a list of ingredients, a list of the required equipment and step-by-step methods. In some of the recipes, you will find swaps which is ideal for picky kids who can now customize their dishes to suit their tastes! Each recipe also contains nutritional information to encourage kids to make healthy choices. The instant pot is a great kitchen appliance which serves many purposes, including slow cooker, pressure cooker and even a yogurt maker. An Instant Pot is the ideal way for kids to get into cooking, as it is safer than using a stove as there are no open flames. Pressure cookers are also much safer nowadays compared to when they were first around many decades ago. This recipe book contains over 50 recipes which are fun to cook and will help your child’s confidence grow. The recipes offer a great variety, including breakfast dishes such as french toast, sides like mashed potato and loads of dinner dishes including cheesy stuffed chicken, sloppy joes and tacos. Did you know, you can even make delicious desserts in the Instant Pot? Whether it’s cheesecake, pie or chocolate cake, you can make it all in the Instant Pot! 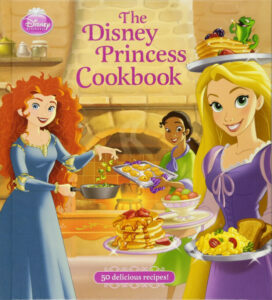 This is a great cookbook for young girls who love the Disney Princesses! There are 50 recipes included, each featuring simple instructions, attractive photos and tips to help out. This book is aimed at kids aged between 6 and 8 years old, although the whole family will love eating the finished dishes! Each recipe includes a picture of a Disney Princess, which is great for helping kids stay engaged and interested. There is a great range of recipes including hummus, eggs, popcorn and cupcakes, so there is something to appeal to all tastes. The DK Children’s Cookbook is packed full of over 150 incredible recipes which are broken down into 9 categories. Some of the categories include soups, light bites and of course cakes and cookies! There are also pictures of all the main pieces of kitchen equipment, so kids can learn the names of all the tools they are likely to require. Each recipe has a photo of the finished dish, as well as pictures of every step of the recipe so kids can easily see exactly what they need to do. The recipes encourage kids to be adventurous with food, using ingredients your child might have been reluctant to try before such as lamp and shrimp. This book is aimed at children aged 7 and above, and everyone will love eating the delicious meals! The MasterChef kids cookbook features 100 recipes which are inspired by dishes made by contestants on the program. It comes in a paperback or spiral-bound edition, the latter of which is easier to use as it will sit nicely on the work surface making it easier to read. This book is aimed at older kids or teens – the recipes are not as easy to follow when compared to the other books reviewed here. The Masterchef junior recipes might be better suited to those young teens who are considering training to become a chef. Some of the recipes use fairly high-end ingredients, which is great for encouraging kids to try new things but it does mean the ingredients can be difficult or expensive to source. This cookbook is simply a must have for any Harry Potter fan with an interest in cooking. There are over 150 Hogwarts-inspired recipes in this book such as treacle tart and pumpkin pasties. The book is ideal for any Potter fan – it’s aimed at those from the age of 9 – 18 years, so pretty much anyone can enjoy using it. The book is styled to look like a spellbook, and the categories resemble scenes from the books and movies such as “Treats from the Train” and “Holiday Fayre”. So, fans of the series will enjoy these fun references. The recipes in this book are different to those found in most children’s cookbooks, as they are mainly traditional British recipes such as steamed treacle pudding and meat pies. This kids baking book features over 90 pages and includes some quick and easy recipes which can be made in just 20 minutes. 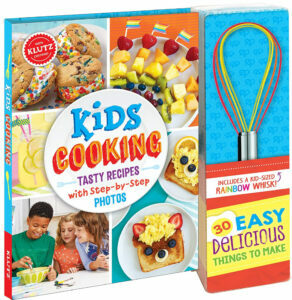 Kids will absolutely love this book, which is packed full of bright and colorful pictures of the yummy treats they can make! Children of any age will enjoy using this book, even older kids and teenagers. However, this is not the book for you if you are looking for some healthy eating ideas for your child! The recipes in this children’s cookbook are excellent for a birthday party or sleepover. Kids will have fun making the recipes with their friends and of course they will love eating the finished dishes together. The recipes are fun and easy to make, so it’s perfect for kids who have little or no experience of cooking or baking. Klutz is a well-known and trusted manufacturer and this cooking set for kids is just as good as you would expect. This set comes with a book of 30 recipes and a colorful, child-sized whisk. Kids will love having their very own utensil to use in the kitchen, and this one is incredibly useful as it is required for half of the recipes in this book. The kids cookbook book is very well-presented and makes following the recipes easy for kids. There are full-page photos of the end results, as well as smaller pictures showing each step of the method. All the ingredients and equipment needed for each recipe are also pictured on it. 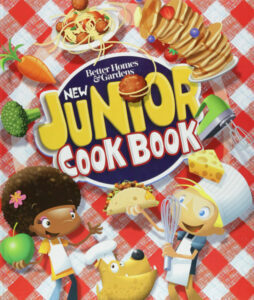 The pages also have fun facts and tips to help kids learn even more about their food and cooking. The Everything Kids Cookbook contains almost 100 recipes so there’s something for any occasion. As well as great recipes, you’ll also find trivia, puzzles and tips on healthy eating and food safety. So, not only will kids learn to cook, they will also learn how to make healthy food choices which can help instill good habits for later in life. The book is aimed at children aged between the ages of 7 and 12, so you can be sure it will get a lot of use. Some of the recipes you can find inside this book include tacos, fries, s’mores and pancakes, so there are loads of kid-friendly classics. The one disappointment about this book is the lack of photographs. There are so many great offerings when it comes to great cookbooks for children, but one which really stands out is DK’s Complete Children’s Cookbook. It has a huge amount of recipes and fully detailed instructions with step-by-step pictures. The book also helps introduce children to the different tools and pieces of equipment they might use when cooking. The larger number of recipes ensures there is something to suit the whole family, and it’s great for broadening your child’s horizons when it comes to their eating habits. What are the Benefits of Learning to Cook? Learning to cook is really important for children for many reasons. It can help boost their confidence as well as encourage them to try more new foods. Kids can also learn about nutrition and where food comes from – they are sure to have a question or two to ask when they are cooking. This can be great for promoting bonding between parents and children – you might even find that cooking together becomes a new hobby to enjoy together! Of course, learning to cook can help install good habits for later in life, even when your child goes off to college. If they learn to cook early, they are more likely to keep it up and eat healthily as a student and an adult rather than relying on processed and junk food. How Can I Encourage my Child to Eat Healthily? All parents know the struggle of trying to get a child to eat healthy foods, a problem which is becoming more and more common with increasingly accessible, and cheap, junk food. Getting kids involved with buying and preparing food from an early age can certainly help them enjoy healthier options. Sit down with your child and pick some recipes from their new book, then write a list and go to the storage together to buy the necessary ingredients. Children will love being involved in the full process from start to finish, and will love sharing their healthy dishes with the whole family! Healthy food doesn’t have to be boring – you can make homemade versions of their favorite ‘junk’ food which will be much more nutritious than the original. One recipe many kids enjoy making is burgers – use lean meat and broil rather than grill them. You can also make oven-baked potato wedges rather than fries, or experiment with different vegetables such as yams or parsnips for example.